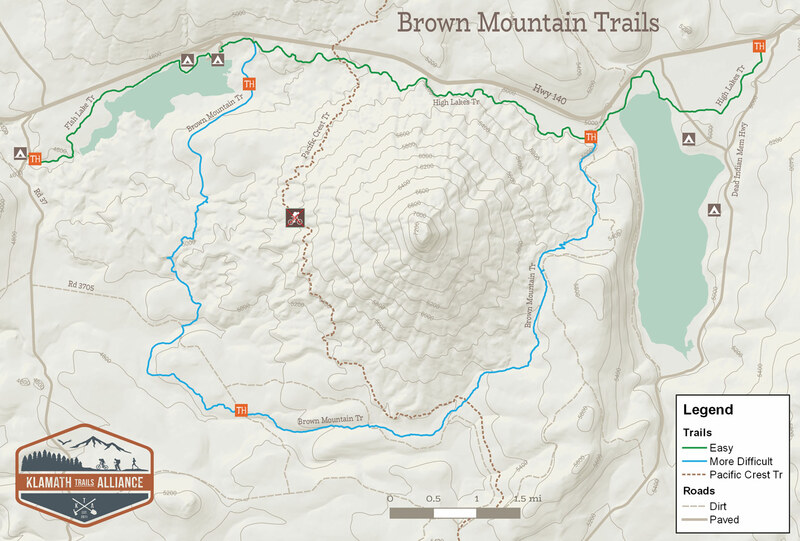 Brown Mountain has a small network of trails including the Brown Mountain Tr, High Lakes Tr, and Fish Lake Tr. The Brown Mountain trail crosses the Pacific Crest Tr (No bicycles on PCT) in two places. It is a do-not-miss experience on the border of Klamath and Jackson County near Lake of the Woods and Fish Lake. In 2016, the KTA adopted the maintenance responsibilities for this trail system as a partnership with the Rogue River-Siskiyou and Fremont-Winema National Forests. Early 2016 produced an unusually large number of blown down trees, so many hours of work went into clearing this trail for use. The High Lakes Tr is an uber-groomed easy trail between the Lake of the Woods resort and Fish Lake that then can be extended around the mountain on Brown Mountain Tr for those looking for a more technical adventure.